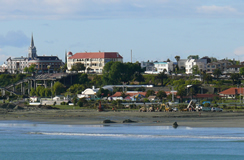 Pleasant View Bed & Breakfast overlooking Timaru's beautiful Caroline Bay is a hidden gem, offering you modern seaside bed and breakfast accommodation. You'll be within easy walking distance of downtown Timaru's many restaurants and shops, Caroline Bay, and our beautiful coastal walking and biking tracks - and we may be able to lend you a bike. 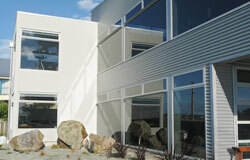 You'll have stunning sea views, and views across the Port, Caroline Bay and the mountains. We regularly see dolphins, watch the yachts and jetskis in the bay, and view the ships and boats coming into the harbour. Relax in our modern, architecturally designed home built with B&B accommodation in mind. We're sure you will enjoy your stay with us. Your hosts, Rosemary and Ian Rhodes. 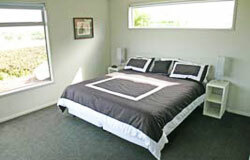 At Home NEW ZEALAND for Quality accommodation NZ’s largest group of regularly inspected Bed & Breakfast Operators.